Like with everything else, the internet has completely transformed the way people find jobs. With all the different online job boards - from the industry specific to any job imaginable - people now have an endless amount of options when looking for a new gig. [DISCLAIMER] This is not to say that age-old tactics (networking, referrals, job fairs) or other online tools (social media, email, industry websites) aren’t worth using. Just like job boards, when used properly these sources can produce qualified candidates. Plus, it’s usually a good idea to have a strategy that combines a few of these so you can reach both offline and online candidates. I decided to focus on three job websites commonly used by irrigation and landscaping businesses. Others like LinkedIn, CareerBuilder and Glassdoor are great but typically cater more to companies posting white-collar, office jobs. But If there’s any other online source that has worked for your business in the past, let us know in the comment section below. 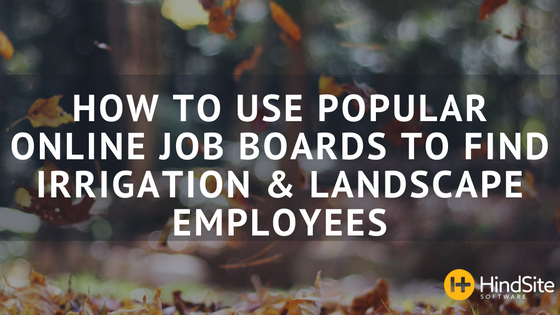 When it comes to posting a job online for your irrigation and landscaping business, you’ll see the best pay-off if you understand two things: 1. The different characteristics (pricing), features (Pay-Per-Click, Free Posting) and benefits (traffic, audience) each job board offers 2. How to successfully use each platform so your post is seen by as many ideal candidates possible. - Hands down the most popular and used job posting site in the world. Stand out from the crowd: To make your job post even more attractable, incorporate unique details about your business in each section. Filter out unqualified candidates: Use application questions to get rid of people that don’t meet your job requirements. The power of application questions: Be cautious to only apply the requirements you really need, adding just one wrong requirement can limit how many see and apply to your post. Put yourself in the shoes of your candidates: Don’t just list what kind of person your business wants, rather think about what your ideal candidates are looking for and include it in the jobs description. Understand the difference between the ‘job ad’ and ‘job description’: The job ad sells your post. Its what candidates see as they browse the list of jobs. The job description is what they see after clicking on your post and is where you outline the position’s specification. Reduce the flood of applicant to a more manageable leak: One trick is to have the applicants call and leave a voicemail answering a relevant question. This allows you to easily screen and filter out the massive amount of unqualified candidates you’ll get. Make your job stand out: Like when using Indeed, focus on wording that both describes the position and makes the reader click on your post to learn more. Flip the script: Take the perspective of your candidates by performing a search that would generate similar jobs. You’ll notice most of the post are strikingly similar and boring. Take advantage of this by figuring out how you can differentiate your job from the rest of the pack. Each job board has unique features and benefits so it might take some trial and error to find which one is best for you. But you’ve probably realized that no matter the job board, the key is creating a job post that your ideal candidates won’t be able to ignore. Having a successful and profitable irrigation and landscape business starts with finding and hiring great employees. It takes pressure off the owner and gives your business the necessary personnel to provide customers with excellent work and superior service.